Billbergia was established as a genus in 1821 by Thunberg. The name is a tribute to the Swedish botanist Gustav Johannes Billberg (1772-1844). The genus Billbergia comprises ca. 60 species growing mainly as epiphytes from southern Mexico to northern Argentina. The greatest number are found in Brazil. The basic rosette of the plant is made up of relatively few leaves (in some species as few as five or six) which grow upright forming a narrow tube or, if the leaves flare out, a vase, which can store large amounts of water. The leaves are toothed, although in some cases very sparsely. The distribution of leaf scales (trichomes) often produces white or silver banding, particularly on the undersides (abaxial) of the leaves. Flowers are borne on a scape which rises out of the tube and is covered with pink, coral, or intensely red bracts. The flower scape may be erect or may be pendent, often suspending the flowers well below the plant. The flowers range from virtually colorless to deep violet, some are night-bloomers and a few are fragrant. 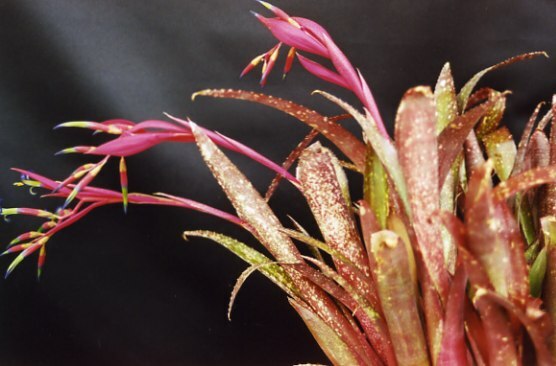 According to the petal habit Billbergias are divided into two groups: billbergia, in which the petals recurve slightly and helicodea, in which the petals coil back like a spring. The seeds are contained in hard berries just below the flowers. Pups are produced on short stolons so that a clump forms quickly. Billbergias in habitat are generally epiphytic and may also grow on rock. In culture some (B. nutans, B. pyramidalis) also thrive as terrestrials in ordinary (well draining!) garden soil. They prefer a small pot. Billbergias are usually grown "hard"strong light to enhance leaf coloration and markings, little or no fertilizer to ensure that the plant does not outgrow its optimum size and color. The species name often alludes to a characteristic of the plant. vittata means "striped" or "banded," zebrina "like a zebra," maculata "spotted," chlorosticta "dotted with green," marmorata "marble-like," horrida "rough, bristly." Rosea and decora describe the colorful bracts. nutans "nodding," pyramidalis "pyramidal" (as opposed to the usual scattered array of flowers), leptopoda "thin-stemmed," filicaulis "thread-like stems." Billbergias have not been important commercially because their flowering period is quite brief. They are superior foliage plants which tolerate dry air and, with their impounded water reserves, can survive the forgetfulness of their owner much better than most other plants. Hybridization has produced stunning plants, e.g. Muriel Waterman and Fantasia. Don Beadle specializes in hybridizing billbergias and has produced incredible (and pricey) crosses.